Join a Group and visit the Alhambra including Tickets, Guide and Transport. 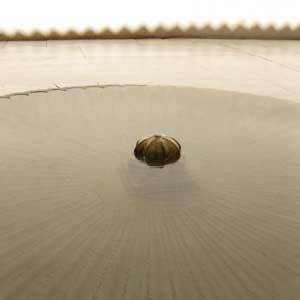 After your visit to the Alhambra relax in a traditional Arab Hamman bath (including massage) in the city centre of Granada. Your tour includes the tickets to all parts of the Alhambra and the private guide during the whole morning. The guided tour will last aproximately between 2,5 and 3 hours and will be in English. Give yourself some time for relaxing in an authentic Arab Hamman Bath. Three differents baths and a steam room will make sure that you relax completely. The service lasts one hour and a half and includes a massage. The Hamman has five different rooms at your disposition: Warm room, Cold Room, Lukewarm Room, Resting Room, Steam Room. The bath is complemented by a traditional hot stone massage which is done with a Kessar glove and natural soap. The service lasts 15 minutes and is included in the overall time of 1,5 hours. 1. Pick up and drop off from your hotel to the monument in a comfortable minibus from which you can enjoy a short sightseeing tour of the city. 2. Alhambra tickets, that gives you access to every area of the monument open to the public. 3. Accompaniment by a specialized official guide in the monument. 4. 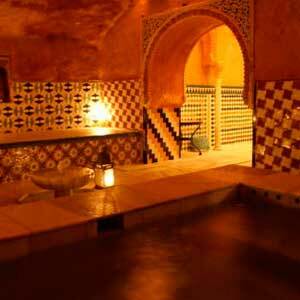 Arabian bath session in an authentic hammam. 5. 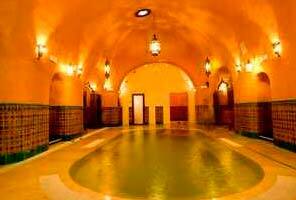 If you have chosen Rate 1 ALHAMBRA+BATH COMPLETE includes a massage of 15 minutes. We will pick you up from your hotel in Granada City Centre between 9.15 and 9.45 am. In case you are not lodged in a hotel in Granada or the hotel is not located within 5 km of Granada City Centre, the meeting point will always be at the Granavision Welcome Visitor Centre, next to the Alhambra (just 100 meters from the Car Park N1), between 9:40 and 9:50am. Although the tour will start from 10:00am, our Reception Centre is open from 8:30am, so we recommend you go early in the morning, so you can find out information about tourism offers in the city, enjoy our reading spot and free Wi-Fi area or have breakfast in the cafe while the children have fun in the playground. Our greatest wish is that your day in Granada starts in the best way possible. Alhambra y Generalife Sightseeing (Granavision - Vimeo). Your booking will automatically enter into our system, thus your confirmation is not required. However, in case you did not tell us about your hotel for the pick-up location we kindly ask you to do so the day before your starts between 11am and 1pm, calling at +34 682 086 011 o +34 958 535 872. Your booking will be automatically confirmed. Once completed the booking form you will receive the confirmation and voucher in your e-mail inbox. The voucher has to be presented on the day of the tour. Ocassionally, the tour will have to be done in two languages, however, the group's size will never exceed 30 people.